Buy a house anywhere but the U.S. and Canada, and chances are you won’t have your own agent. That means the commission paid by overseas sellers can total 2.5 percent or less — about half as much as they’ll shell out in the U.S.
Now Seattle-based listing broker Surefield says the time is ripe to bring U.S. real estate brokerage into alignment with the way business is done around the rest of the globe. 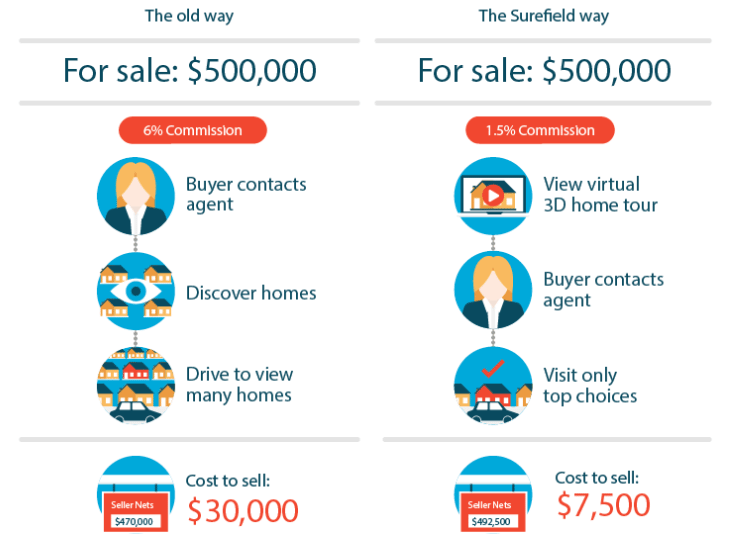 When Surefield lists homes in the multiple listing service, it offers buyer’s agents just $2,000 — a fraction of what they usually earn by splitting the listing broker’s percentage-based commission whenever they bring a buyer to the closing table. Eraker said Surefield can afford to charge less than traditional brokerages because of the virtual 3-D models that it produces for all its listings. Surefield asks prospective buyers to view the models — which Surefield creates using its own camera and software — before deciding whether to visit a home in person. The brokerage is betting that the ubiquity of listings online and the virtual 3-D models it produces for all its listings can liberate sellers from “prepaying” a buyer’s agent’s commission. The strategy is sure to irk some real estate agents, raising the possibility that they’ll avoid showing listings represented by Surefield to their clients. That’s a problem other discounters have faced in the past. Skeptics may argue that sellers who list with Surefield risk taking home less money than they would had they worked with traditional brokers because their homes won’t be exposed to as many buyers. While many brokerages have tried to win listings by cutting their own fees, they often advise sellers to offer cooperating brokers who can bring a buyer to a sale a more traditional split. Redfin, for example, charges sellers in some markets a total commission of 4 percent, with Redfin’s fee amounting to 1.5 percent of the sale price, and the broker representing the buyer earning a commission equal to 2.5 percent of the sales price. But Eraker — a co-founder of Redfin — doesn’t buy it. While its commission fee is far from traditional, Surefield provides all the services offered by a traditional brokerage, he said. Click the image above to explore a virtual 3-D model of 14678 NW Seabeck Ridge Way in Seabeck, Washington produced by Surefield. Since buyers can thoroughly explore the inside and outside of a home using a Surefield model, the thinking goes, only those who are most likely to purchase the home will request a showing. That means that Surefield has to coordinate a fewer number of showings per listing than the average broker, translating into operational savings, according to Eraker. Surefield passes those savings on to clients in the form of a severely discounted commission, he said. Shortly after announcing that it would add virtual 3-D models to its listings, Redfin began experimenting with charging a listing fee of just 1 percent in Washington, D.C. 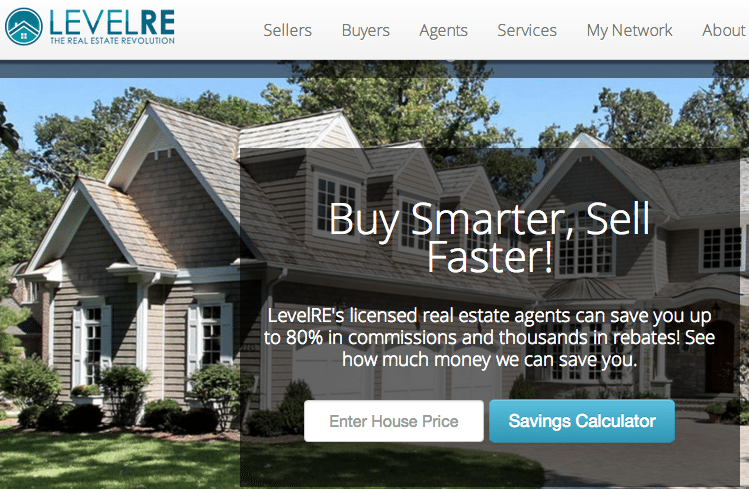 But there’s a big difference between Surefield and Redfin. Surefield charges a 1.5 percent listing fee that includes $2,000 that’s earmarked for the buyer’s agent — if the buyer is represented. Redfin still offers a typical offer of compensation around 2.5 percent to a buyer’s agent, meaning it charges a total commission of around 3.5 percent to a seller in D.C.
Surefield, on the other hand, dangles what typically will turn out to be a much smaller commission to an agent for bringing a buyer to a sale. On the sale of a $400,000 home, the $2,000 Surefield offers to the buyer’s agent amounts to just a 0.5 percent commission. A typical buyer’s agent commission of 2.5 percent would generate a $10,000 payday on the same sale. Eraker concedes that Surefield’s path could be “rocky.” Buyer’s agents might not be thrilled at the prospect of representing clients in transactions that pay them peanuts compared to other deals. Eraker said Surefield’s approach still leaves the door open for a buyer’s agent to secure a typical commission. The brokerage’s business model simply makes a buyer’s agent commission more of a matter of negotiation, rather than a prepaid amount factored into a property’s listing price, Eraker said. It’s possible a Surefield client might agree to cover a commission for a buyer’s agent, without making that offer through the MLS. The buyer would just need to write that commitment into an offer, Eraker said. Another scenario: If the seller were unwilling to cover a more traditional buyer’s agent’s commission, the buyer could tack on an additional amount to her offer, and stipulate that the seller pass the additional amount on to the buyer’s agent. Surefield would not represent both the seller and buyer when working with an unrepresented buyer. Instead, it would use the $2,000 originally offered as compensation to a buyer’s agent to cover attorney fees for a buyer. Since Surefield listings would force a buyer to weigh covering some or all of a typical buyer’s agent’s commission, it’s easy to imagine that some buyers might choose to drop their agents when moving on a Surefield listing. That’s exactly what buyers purchasing listings represented by Foxtons North America, a discount brokerage that launched in 2000, would often do, said Derek Eisenberg, founder of Hackensack, N.J.-based Continental Real Estate Group, a flat-fee broker. Charging sellers a total commission of 2 percent, Foxtons originally offered no compensation to buyer’s agents, leading some buyers to drop their agents rather than cover a buyer’s agent’s commission themselves. Competitors reviled Foxtons North America, but the brokerage thrived in its early years, said its founder, Glenn Cohen. Foxtons had about 5,000 listings at its peak in March 2003, he said. After Cohen left, Foxtons started offering a 1 percent offer of compensation to buyer’s agents through the MLS, as Foxtons itself began to hire buyers agents for the first time, he said. Straying yet even further from its roots, Foxtons eventually brought the offer of compensation to cooperating brokers up to 2 percent. Foxtons presumably cranked its offer of compensation up to 2 percent because it judged that 1 percent wasn’t enticing enough for buyer’s agents to show its listings, Cohen said. Cohen says Foxtons was just as effective at selling homes as traditional brokerages, thanks in no small part to Foxtons’ popular listing site and advertising. 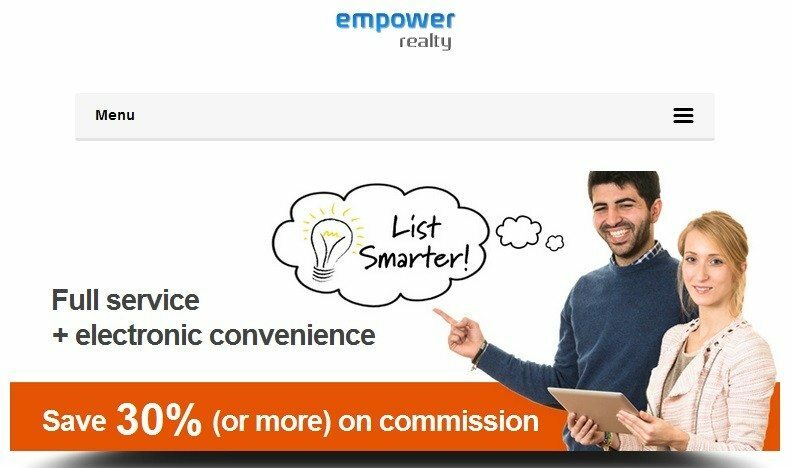 But Eisenberg says he’s noticed that his clients who offer unusually low buyer’s agent commissions often seem to have a tougher time selling. “I really hate to admit this, but I think they [buyer’s agents] do have some power to filter out, I think they do it subtly,” Eisenberg said of agents who might downplay listings that produce smaller paydays. Theoretically, real estate agents might not bring Surefield’s listings to the attention of their clients, but Eraker argues that new technology has made its business model more viable than it might have been in the past. “If agents were to steer people away, maybe that might work in the short term, but that consumer is still going to see that listing in the MLS at that price, and they’re going to want to get into the home,” he said. Throw 3-D models into the mix, which allow buyers to tour homes without the help of a buyer’s agent, and you’ve got a recipe for disruption, according to Eraker. Phil Faranda, broker and owner of Briarcliff Manor, New York-based J. Philip Real Estate, says some buyer’s agents’ aversion to such listings is part of why it may be difficult for Surefield to deliver on its promise of savings. Faranda recalled representing a buyer who purchased a home from a seller represented by Foxtons. The home was listed at $200,000 and Foxtons initially wasn’t going to pay Faranda a nickel if it sold to his buyer. So Faranda asked for some concessions. He said his client would pay $196,000, and only if the seller forked over $4,000 after the sale to Faranda. “The seller probably would have gotten more money and more action and more traffic had he offered a higher commission than sitting out there rotting,” Faranda said. It’s also theoretically possible that an unrepresented buyer who purchases a listing handled by Surefield might end up paying more overall for a home than if she had worked with a buyer’s agent who might have negotiated a substantially lower price. “The $5,000 or $7,000 you save in one line item is smaller than what you could have saved with a good advocate,” Faranda said. Editor’s note: This story has been updated to correct that Surefield charges a 1.5 percent listing fee that includes $2,000 that’s earmarked for a buyer’s agent. A previous version of this story incorrectly stated that Surefield charged a 1 percent listing fee, plus $2,000 that’s earmarked for a buyer’s agent.